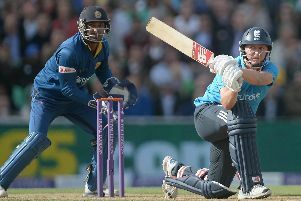 England's Joe Root reaches his century at Edgbaston Photo: David Davies/PA Wire. As the Royal London Series moves on to The Oval today, Sheffield’s Joe Root is not about to rule out another performance of the same magnitude achieved at Edgbaston - when England piled up more than 400 for the first time in their history en route to a record 210-run win. Root, one of the Birmingham centurions alongside Jos Buttler, knows nonetheless that the remainder of the five-match series presents a significant and telling test of the hosts’ new adventurous methods. England resolved, after their winter of woe at the hands of New Zealand and others in the World Cup, to come out firing with bat and ball - and they delivered brilliantly at their first attempt. They have a history already this year, however - in two Test series, rather than one-day internationals - of failing to consolidate after very promising starts, having squandered 1-0 leads over West Indies and then New Zealand. They arrived both in Barbados and Headingley with high expectations after impressive performances, and so it is here following the raft of new records set in the midlands. “Obviously the way we played there was pretty much the perfect performance,” said Root.